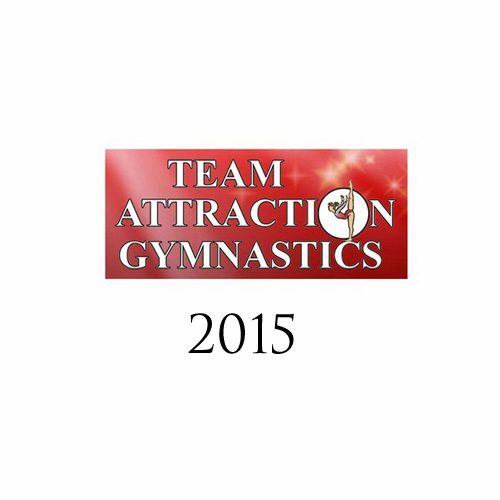 In 2015, Team Attraction Gymnastics (TAG) hired US Gym Products to radically reinvent the gym designs for their training space. 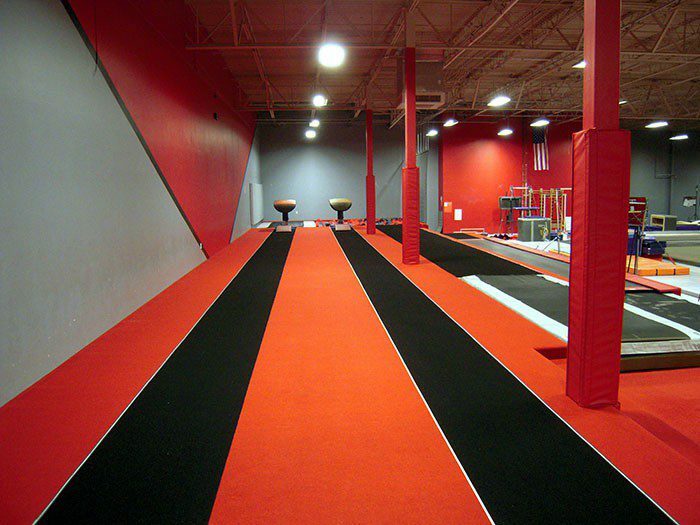 This facility, opened in 2010 by former NC State Gymnast Monica Berry has created a reputation of being one of the best gyms in North Carolina. Originally a 5,000 sq. ft. facility, TAG has steadily grown over the years through their hard work and great reputation. In 2011, they expanded to 16,500 sq. ft. Then again in 2014, they expanded to their current size of 20,000 sq. ft. By the end of 2014, it had become readily apparent that their vaulting & tumbling area was inadequate for a level 10 program. The pits in this area were greatly restricted in size and depth due to building construction and sewer lines. US Gym products developed the solution to upgrade these pits in both size and depth. The requirements were pretty straight forward. 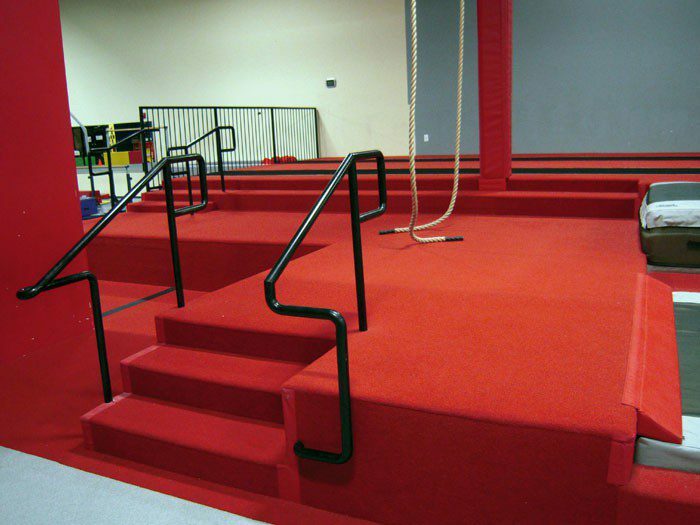 Keep construction costs to a minimum, incorporate deep foam pits and build everything while keeping the entire gym outside of the construction area fully operational. Cutting out old concrete, excavating new pits and pouring new concrete would have been extremely dirty, noisy and required large areas of the gym to be closed for extended periods of time. This was not an option. So our innovative design allowed us to do all the renovations with NO CONCRETE WORK. This drastically reduced construction costs and allowed for the gym to stay open. 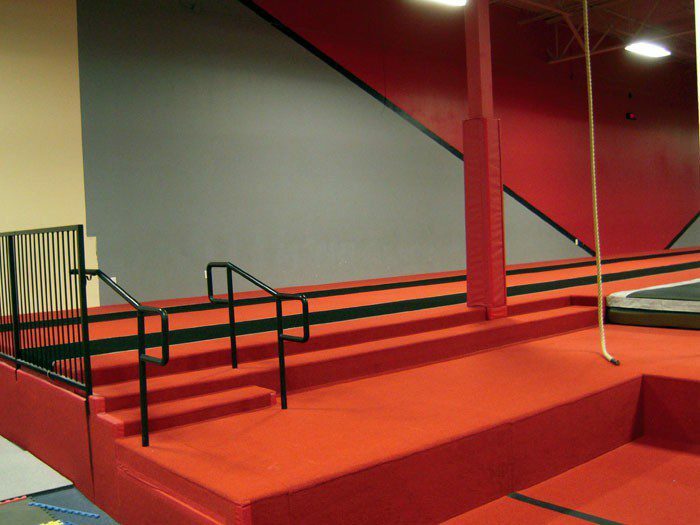 In our gym designs, we were able to transform the existing 36″ concrete pit and turn it into a 72″ deep foam pit. We built a 36″ platform around and leading up to the concrete pit. 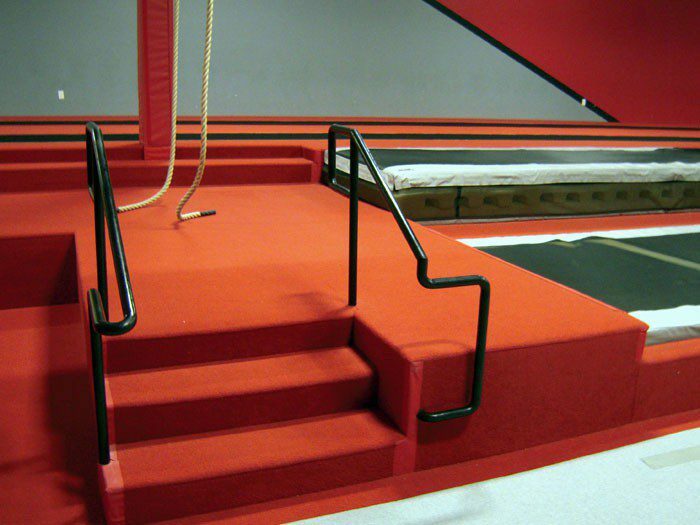 Then, we installed a trampoline bed on top of the concrete pit allowing for a function deep foam pit. With this new design we increased the landing surfaces by 50%. This new functionality was all built in the same footprint as the original training space. As you can see we built a multi-level platform. Only the back end of the vault strip required a safety railing. The entire top of the platform is covered in 1-3/8″ carpet bonded foam (CBF). This allows for a flush and extremely safe training area. 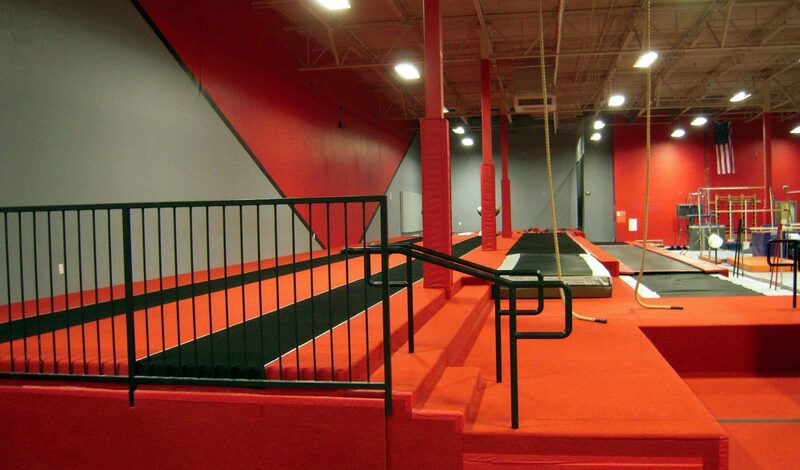 We utilized red CBF which is a gym color, then black for the training surfaces (vault runways, tumbling strip). Here the image shows the main pit area. The left vault can have a large 20 cm landing mat placed on it for a hard landing surface. 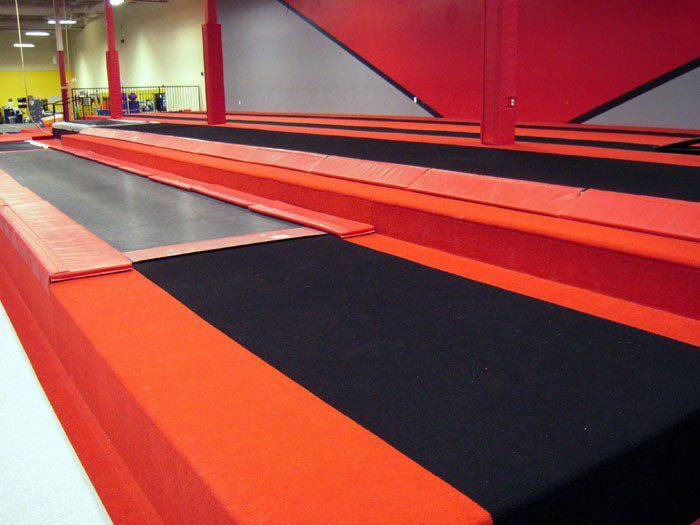 Netting on the right side prevents any athlete from falling off the platform while tumbling. 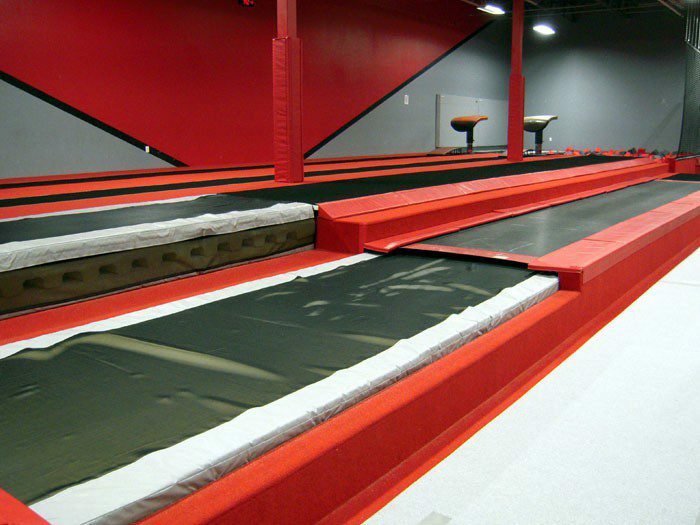 This tumbling strip has a deep foam pit on the far end and a resi on the near end. The tumbling strip additionally has 2″ EVA (high bounce) CBF on top that is beneficial for training college level athletes. This is the 16′ extra-long Tumbl Trak resi pit. The Tumbl Trak is built directly into the platform. We made extra wide pads for the right side to cover the platform wall. On the far end of the Tumbl Trak is the extended runway. We incorporated black CBF the same width as the bed for ease of use for the athletes who need a longer run. Along the edge of the tumbling strip is the angled border we made. This is for added safety as well as a clean professional look. Here is the main staircase for the platform. On the right side is the angled wedge placed at the end of the Tumbl Trak resi mat for added protection and safety. This section of the platform was by far the most complicated to pad with the CBF. There were a lot of areas that needed to be folded as well as cut in the railing posts. Our installers welcomed this challenge. The end result is a completely padded staircase that is both clean and extremely professional looking. In this area, athletes use the platform for stretching as well as a staging area for both vault and the climbing ropes. Additionally, a balance beam can be placed here for dismounts into the resi pit for the tumbling strip. The stairs and steps are padded cleanly and seamlessly. On the back end of the platform, it is covered in CBF that is removable for access underneath the platform for storage. 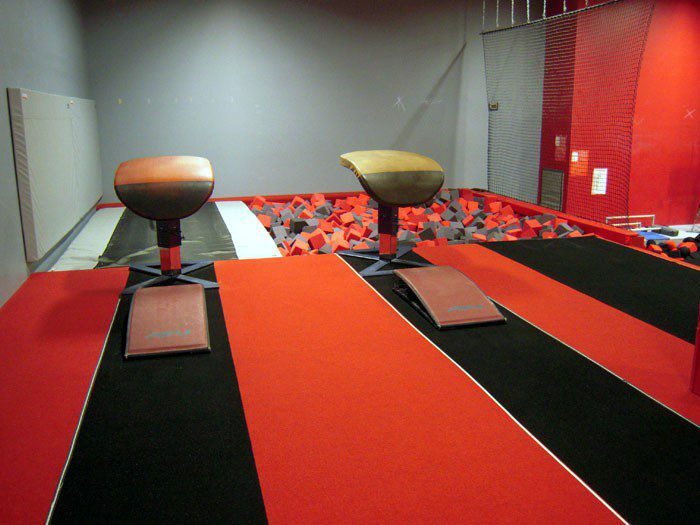 Team Attraction Gymnastics (TAG) hired US Gym Products to radically reinvent the gym designs for their training space. 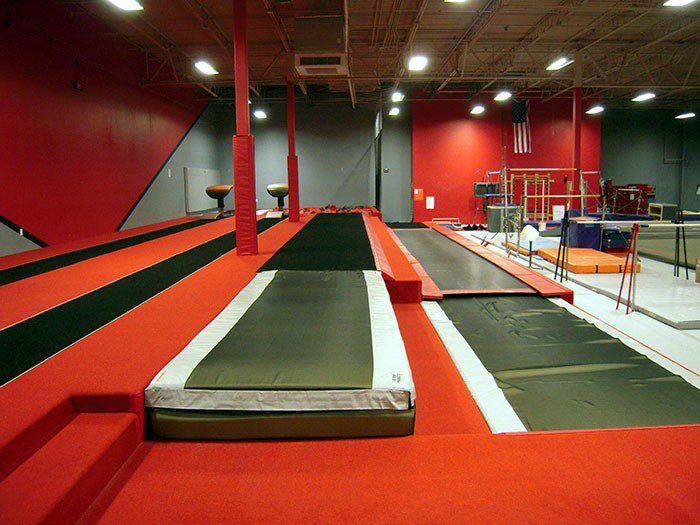 This facility, opened in 2010 by former NC State Gymnast Monica Berry, has created a reputation of being one of the best gyms in North Carolina.